De grootste uitdaging van de 21e eeuw is het ontwikkelen en implementeren van methoden en oplossingen die niet alleen de beschikbare ruimte optimaal benutten, maar tegelijkertijd de economie versterken en het (leef)milieu verbeteren. Een en ander in onderlinge samenhang op weg naar duurzaamheid van productie en consumptie. e) waar nodig 'aquapunctuur' wordt toegepast (lokale aanpassingen op het gebied van vaarwegbreedte en -diepgang, baggerregiem, brughoogte & brugbediening, aquaducten, laad- en loswallen, milieuvriendelijke oevers, eco-zones). Dat is de kern van de visie van Ronald Waterman om de historische vaarwegen in ons land en elders in Europa en de wereld aan een tweede dynamisch leven te helpen. 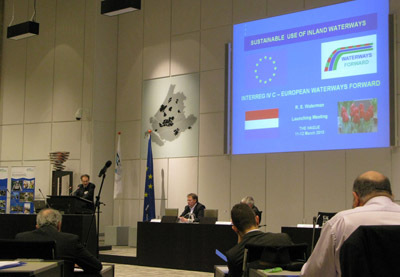 Hierna een samenvatting van zijn betoog tijdens de startbijeenkomst van het Europese project 'European Waterways Forward' in maart 2010 te Den Haag. The great challenge of the 21st century is the introduction and implementation of methods that simultaneously strengthen the economy and improve the environment to achieve sustainability. 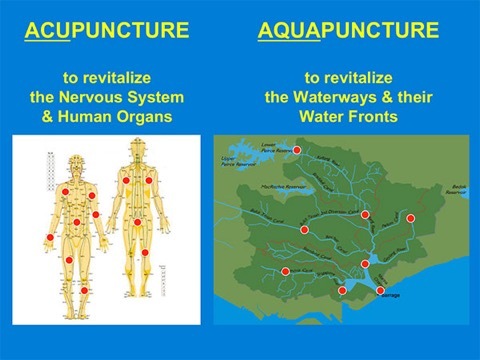 This is exactly where the so-called AQUAPUNCTURE OF INLAND WATERWAYS fits in as the key to promote regional, socio-economic development, while safeguarding environmental values & nature as well as nautical safety. Inland waterways – rivers as well as canals –, linking cities and the country side in between, are very important for the transport of raw materials, wastes, finished products and persons. Nowadays these waterways are becoming increasingly important also for tourism, recreation and sport. At the same time the significance of the waterfronts along these waterways for living, working, tourism & infrastructure is coming to the fore. The combination of attractive rivers and canals, their waterfronts, the landscapes and the historic cities along and beyond the waterfronts, is ideal for water related tourism. In this way it is possible to stimulate visitors to use these waterways for touristic purposes. At the same time it is absolutely necessary that measures have to be taken to ensure both nautical safety, nature values as well as water quality & quantity. In addition mitigating measures must be taken with regard to negative effects of climate change. Waterways Forward, a European waterways improvement programme within the Interreg IVC framework with 17 regions in 13 European countries as participants, has selected the Rhine-Schie Canal in the Netherlands as prime project. In Waterways Forward a.o. the Dutch Vereniging Regio Water (Association Region Water), British Waterways, Voie Navigable de France and Italian Navigli Lombardi are partnering. 75% of the Rhine-Schie Canal investment is sponsored by the European fund of Regional Development. Project management is dealt with by Stichting Recreatietoervaart Nederland (see this website: http://www.waterways-forward.eu ). • Sports boats. In the area are many student rowing clubs with a high competitive standard and Olympic medals have been won over the years. 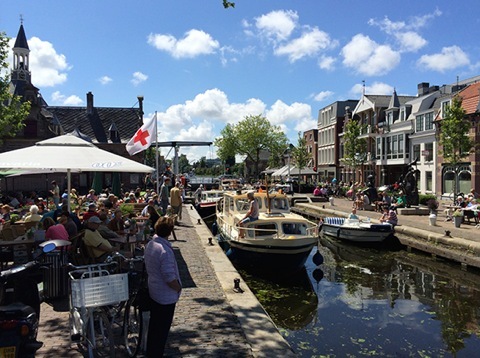 The Dutch Association Region Water promotes the sustainable use of the waterway system with attractive waterfronts for tourism, recreation & sport. Participants in this association are 13 Cities & 2 Water Boards with representation from Chamber of Commerce, hotel/restaurant/café-sector, leisure parks, water sport sector, fishing, canoeing, rowing, sailing, motor boating. 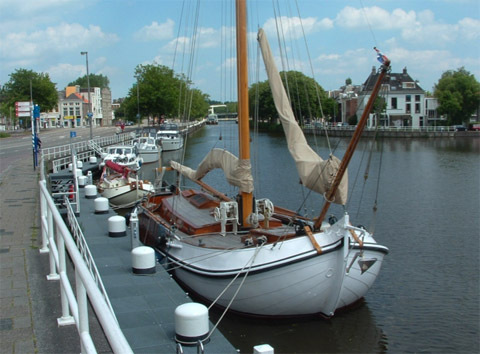 Close cooperation exists with Dutch Recreational Waterways Foundation (SRN), Province South-Holland & local harbour masters (safe guarding nautical safety), taking into account laws and regulations on the various governmental levels. • Improving canal conditions for navigation referring to depths, widths, canal bank conditions and slope. Loading and unloading platforms. • Height under bridges, ship lock adaptation, bridge and lock servicing, maintenance dredging. • River canalization, river / canal / training works with regard to critical sections. • Provision for safe mooring, berths, marina’s, yachting harbours together with adequate facilities. These facilities are: drinking water supply, pumping stations for delivery of domestic wastes and bilge water, sewer systems, toilets, showers, electrical current supply, sign posting. • Ensuring navigational safety for all users of the waterway, with special attention for interaction between commercial craft and recreational vessels. • Development of waterfronts with attractive boulevards with green elements, real estate developments, sufficient hotel – restaurant – café capacity, museums. • Towing paths, footpaths, bicycle tracks along the waterways and eco zones. • Promotion, restoration and maintenance of cultural heritage values. • Conservation and development of landscapes along the waterway in between the towns. • Introduction of cruises with music and catering aboard. • Introduction of special boating events such as floating flower shows, concerts on water, naval parade of historical vessels, regattas, rowing competitions, revival of historical journeys on the waterway, water taxis linking historical sites. • Waterways are essential for irrigation, drainage, transport, recreational use, drinking water supply, process water, cooling water, bathing water, fishing, the aquatic ecosystem in the waterways and the terrestrial ecosystem along the banks. • For the sustainable use of the waterways, water quality plays an essential role. According to the “European Water Framework Directive”, the “Water Law” and the “National Water Plan” an adequate water quality has to be realised. From the land side, this means sewer systems & waste water purification installations. From the canal side, this means that every vessel must have a provision for tank storage for bilge water & domestic waste water, while the type of combustion engines must be such that harmful emissions are avoided. • Introduction of electrically powered vessels and the use of photovoltaic cells. • Drastic reduction of phosphate & nitrate emissions, stopping eutrophication & formation of blue green algae, thereby restoring biodiversity and improving the ecosystem. • Climate change leads to rise in temperature, sea level rise, higher frequency & intensity of storm surges, more inland: higher frequency & intensity of rainfall with intermittently periods of drought. In addition we have to deal with land subsidence, a higher % hard surfaces, deforestation, with a quicker run off towards canals and rivers, resulting in high water levels, with in between periods of low water levels. Therefore provisions are needed for both calamity water storage as well as water retention basins in periods of water shortage. In all cases adequate pumping capacity for water level regulation is necessary.